Time for Radhika's "Blog Hop Wednesday Week-10". Today I am paired with Monica @ "Sin-a-mon". She has many tasty dishes at her space. I picked "Achari Broccoli" from her blog. I never cooked broccoli as a side dish. This suits me very well. I find a way to treat my family with a healthy and tasty side dish. I replaced pumpkin with paneer. So here I go.....!!! * Boil one cup of water. Add Broccoli florets and cook for about two to three minutes. * Drain out the water. * Heat oil in a pan. Temper it with panchforan. Let them crackle. * Add onions. Cook until they turned pink and transparent. * Add turmeric powder, chilly powder, dhaniya powder and amchur powder. Cook for a minute. * Add Blanched Broccoli and mix very well. * Add tomato and paneer cubes. * Mix very well and cook for about two to three minutes. * Switch off the fire. 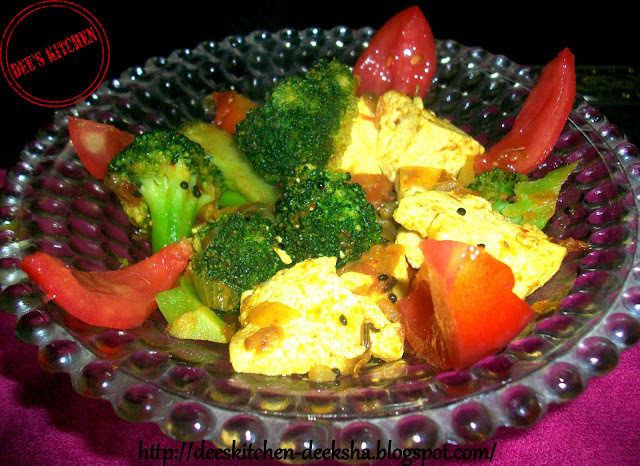 Achaari Broccoli with Paneer is ready to be served with roti or Parantha. The colorful platter is just calling to me. 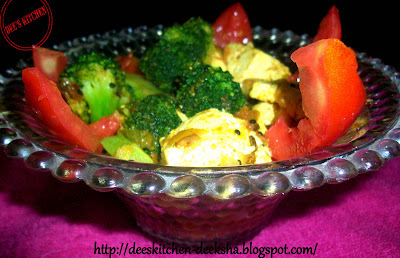 wow achari broccoli.. sounds interesting.. must try, both paneer and brocoli are my kids fav..
Super delicious achari broccoli with paneer, just drooling rite now here. The platter is colourful. Nice combo seems workout better. Very healthy, colourful and delicious achari broccoli..
wow too good .. wil try it.. I love achari flavored anything...This ones yummy too!!! You know, I had broccoli for lunch and now I feel like preparing this for dinner tomorrow, nice! so colourful, healthy and yummy.. Delicious tangy and tasty ...the name itself is mouthwatering!